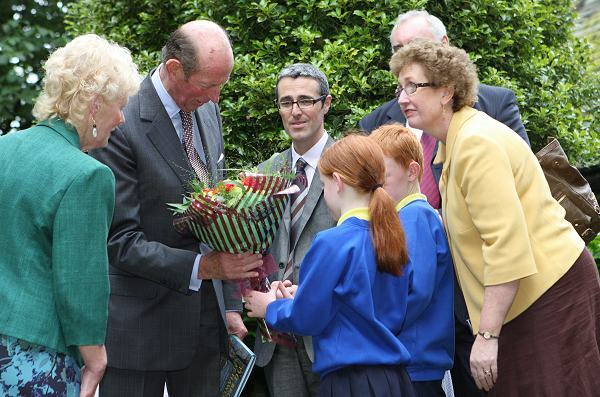 Photo: 10th July 2008 Headteacher Janet Parkinson and children from Haworth Primary School present a bouquet to HRH The Duke of Kent at Haworth Parsonage. The event started at Keighley and continued to Ingrow West. The Duke was invited on to one of the wonderfully restored buses from the Keighley Bus Museum, a brief trip down the Station yard to view the museums of the Vintage Carriages Trust and of the Bahamas Locomotive. It left Ingrow for the location of the classic film of The Railway Children, Oakworth, to meet staff and view the station. The train terminated at Oxenhope to be met by the Acting Station Master Robin Richards, children from Oxenhope Primary School and the Chairman of Oxenhope Parish Council. The Royal party then went on to visit Haworth Bronte Parsonage, HRH The Duke of Kent was presented with a bouquet from the children of Haworth Primary School.